The first Azerbaijani flag was adopted on November 9, 1918, shortly after the country gained independence from the Transcaucasian Democratic Federative Republic. The first flag consisted of a red field, a white crescent and an eight-pointed star in its center. This flag existed for 23 month, before installation of the Azerbaijan SSR by the Soviet Red Army on April 28, 1920. 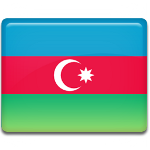 The first Azerbaijani flag has a sacred meaning to the nation. Red field stands for the progress to establish a modern state and the development of democracy. Crescent is a symbol of Islam, and an eight-pointed star stands for the eight letters in the word “Azerbaijan” written in Arabic. According to another version, the star points at eight Turkic peoples, that live in the country. State Flag Day was officially established by President Ilham Aliev as a non-working public holiday in 2009. The first celebration took place in 2010.